Weather Station - Temperature & Humidity (Or search eBay for HIH-4000-001). I've had to replace the HIH-4000-001 sensor again. While replacing it, I noticed that the copper tracks on the small PCB are blackened and starting to corrode. I intend to make new (identical) PCB but will take care to protect the copper with silicone grease or cellulose spray. Replaced the HIH-4000-001 sensor again (reading very low). Fitted new PCB as noted above but it's the sensor that goes faulty. Replaced the HIH-4000-001 sensor again. Reading stuck at 100%. I mounted both sensors on a small PCB with the temperature sensor's 4k7 pullup resistor and a 4-way terminal block. The PCB is fitted inside a home-made Stevenson Screen; full constructional details can be found here. 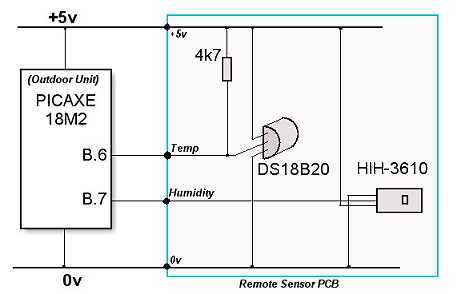 The DS18B20 temperature sensor uses a 1-wire digital signal. 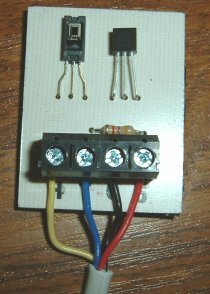 The HIH-3610 provides a 0 - 3.9v analogue signal. I've tested both with 3 metres of ordinary 4-core (house alarm) cable and both performed well. The simplest code for each of the sensors is shown below. More precise code, which reads the values to one decimal place is shown on Peter Anderson's excellent site. Peter's code is used in the final version of my own weather station. The temperature sensor provides ±0.5°C accuracy and the humidity sensor is accurate to within ±2% Relative Humidity so it's debatable how many decimal places it's worth displaying for these values! As they're usually dispalyed to one decimal place, this weather station follows the convention - which isn't to say that the figures are necessarily that accurate (My watch displays the time to the nearest second but it's usually a couple of minutes fast!). Example plot from the software running on the PC. The following notes are taken from the Revolution Education Datasheet for the Honeywell HIH-3610. Picaxe maths definitely isn't one of my strong points so putting the information here is as much for my own convenience - and to help me understand - as anything else. 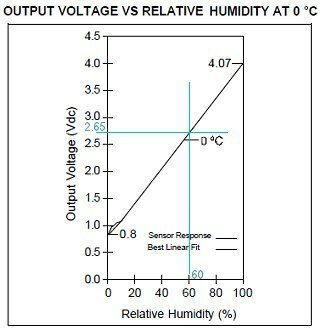 This graph, from the Honeywell datasheet, shows the response of a "typical" sensor at 0°C. The voltage from the sensor is measured with the ADC input B.7 on our outdoor unit's main 18M2 Picaxe Microcontroller. In the code shown above, the value, which is represented as a number between 0 and 255 (ie 256 steps), is stored in the variable b1.